Dan Graham is the founder and owner of Gothic Storm, a label specialised in library music, or as stated on their website: “Epic Emotional Music”. Some of their recent placements includes: Deadpool 2, AntMan and The Wasp, Aquaman, Dunkirk, The Black Panther and the list of blockbusters goes on. In this interview, Dan talks us through some great tips on how you can pitch to publishers, increase your musical output, things to look out for, various deals you may encounter, books that helped him and so many more useful tips that you can use. It took you a few years before you manage to make a living from library music, how were some of those early years and what made you keep going? My conclusion was, of course, that I’m more interested in music and that’s what I want to do. So, I made a search on Google, “How do you make money out of music?” and I remember seeing different options, such as game-, tv- and advertising-music and I thought library music seemed like something I should try. I gave myself two months to try this idea out and in that time I sent out demos to as many people I could find through websites. I probably sent over 2000 emails spread over those 2 months, trying to get anybody interested. About 3 different people came back to me and one was a really good company called Boosey & Hawkes Recorded Music Library, now called Cavendish Music. They were looking for a piano album and could also give me a decent advance, which could get me off unemployment for a month. I saw this as a sign that people are interested and if I only try hard enough anything is possible. In the first 2-3 years, I was mainly working for the advances, even though the official line is that nobody gives out advances, I found that if I was honest about my situation and they liked my music, they would usually agree to give me an advance. It took a few years before I started seeing royalties coming in, but over the years it built and built until after about 5 years it got to a significant amount. That’s when I started to think about starting my own company. What were some of your early experience when starting out writing music for publishers, was it confusing understanding what they were asking for? There are different types of publishers and different kinds of people working for publishers, and to me, the best type of person was someone who was encouraging, likes what you do, they don’t mind if it comes back a bit different to what they were expecting, as long as the quality was good. I had some really bad experiences with people that just gave me confusing instruction that I couldn’t really understand, they used strange terms, such as, “Can you write this more pulsing?” I couldn’t figure out if they wanted the music to undulate or gated sounds. I had even worse experiences working with TV directors because they don’t have any musical knowledge, for example, at one point a director was asking if I could make the music sound more floating. I had no idea what they meant. What were some of the early pitfalls you experienced and what would your advise be to people so they can avoid them? One of my early pitfalls was working too much for just one company. They really liked what I did and did everything they could to keep me writing for just them, without giving me an exclusivity contract, instead, they just agreed to my crazy demands of advances and allowed me to pursue crazy ideas. However, because I had grown dependant on them, when the person who was my main contact at the company got promoted another person stepped in who wasn’t nearly as supportive and encouraging. He started questioning what I was doing and started rejecting ideas for new albums. However, he also got promoted but then new person who stepped in was even worse and gave me instructions I couldn’t figure out. At the same time, the company started saying that they didn’t want me to work only for them because they didn’t want composers who were too dependant on them. But since I had only been working for them for the last two years and they had met all my requirements I suddenly got pulled out from underneath and had to start looking for other companies. For someone starting out and are looking for their first publisher, what do you recommend them doing to accomplish that first step? For example, should they have one great album or is a few great songs enough? It depends on the publisher and different publishers have different attitudes. What suits me since we have different labels for various kinds of music, is that it can be quite useful if someone sends a link to a playlist, on for example Soundcloud, that got various kinds of music in it. Then I can place those songs on the different labels we have. It also let me hear what style the writer is good at. However, I know some publishers who don’t like that because they want to be able to pigeonhole a writer as being a specialist in one area. The album trick that I mentioned in Sound on Sound is the idea that you send a publisher/label about 12 tracks that are free and ready to be licensed. They should sound finished, have a good title and be something that will fit on the label you are pitching to. This makes it easy for the publisher/label to listen to and decide if they need an album like that. It also creates less work for them because they don’t have to put out a brief for their current writers asking for an album like that. Also, as mentioned before, if the album is quite specific it makes it easier for them to figure out if they can pigeonhole it. When you do send that first album does it have to be mixed and mastered too? It needs to sound like a finished album, however, it’s all up to the publisher. Some might ask for the multi-tracks so they can mix it themselves or just unmastered mixes so they can master it. However, for that first pitch and when you want to play it for someone it needs to sound finished and that does mean mastered, but mastered well and not too distorted. For new writers looking for a publisher/label what are some of the things they should be on the lookout for before committing to a specific label? Do research on them, for example, are they a big company, do they have high-quality music with a nice presentation on the website, what’s their recent placements, are the constantly getting used on big things? If the website looks a bit out of date and the artwork looks a bit cheap then maybe they don’t have a good reputation. When publishers ask for in perpetuity deals (when they have the copyright of your music until 75 years after your death) is that something people should be worried about or is that normal? It depends on the type of company. In America it’s not common not to have in perpetuity deals, instead, you have some reversion clause in the contract, especially the royalty-free library and if it’s a non-exclusive deal, then you can take it back any time you want. My company and all our agents that we work with around the world, use in perpetuity deals, which is more common in the higher-end of the library music market. One reason for this is that the music is often distributed to people on hard drives and if it’s not it will most certainly go on a hard drive at some point. Also, within a big company, they will have a big music server that has all their music catalogues in it. This music will either be pre-cleared so they know they can use it or they will know how much a certain company charges for a song. Therefore, if a composer had the right to take their music back after a certain time, you would have to go to all of your agents around the world and they would have to go to every company around the world and start telling them to delete your music from their hard drives. It’s not impossible but it would be really complicated. So, by having in perpetuity deals means they don’t have the uncertainty of their library music being unavailable to them. Another reason is that they will keep earning money from your music for a long, long time. You recommended in your Sound on Sound article that the aim should be one track per week, i.e., 52 tracks a year. How does your setup/routine look that enables you to reach that goal? One important technique I used was that for every musical idea I had I would do a rough piano sketch, I would leave Cubase running, with no click or quantisation enabled, and give myself 20 minutes to record rough sketches for each idea. In one hour I would have outlined three different ideas and if all were good, great, but if one idea was a lot better than the others I would focus on that idea. The reason is that working on the one idea that excites you will enable you to make it better and be able to finish it, so it’s a great time saver. If you would just stick with your first idea, which might not have been your best, you are wasting time, instead, if you quickly lay out three or more ideas and pick the best one to focus on, it will save you a lot of time. When the best idea is finished, I have the whole song outlined on piano, heavily quantised and if something is too difficult to play I draw it in. The piano outline would capture the emotion, the tempo, the dynamics and the chord progression of the whole song, rather than just a few bars. Working and perfecting only a few bars is one of the worst things you can do because things end up not fitting together. For example, you might have 4 bars sounding great but it doesn’t link to the next bit. Therefore, having a great outline of the whole track acts like a skeleton that you build everything else on. This will speed up the process too. I also have a Word document where I write down the different sections of the songs and what should happen at each point of the track. For example, I want an Obo solo here, tremolo strings there, this is where the drums come in, etc. By writing it down it becomes a to-do-list and it’s very quick to follow your own list of things to do rather than just getting stuck wondering what should come next, or what will or won’t work. I would also have an instrument list in order of importance, so, my Word document have two sections, one for what instrument to use and the other one stating which instrument is doing what at what point. I would first imagine it in my head while listening to the piano guide and give myself 30 minutes to lay out each of the different instruments, not perfectly, but as a guide. After you listen back and you can hear all the different things that are wrong, you go back to each section and write down on another list of what needs changing. Spend another hour fixing it and on each cycle, it will become more and more finished. 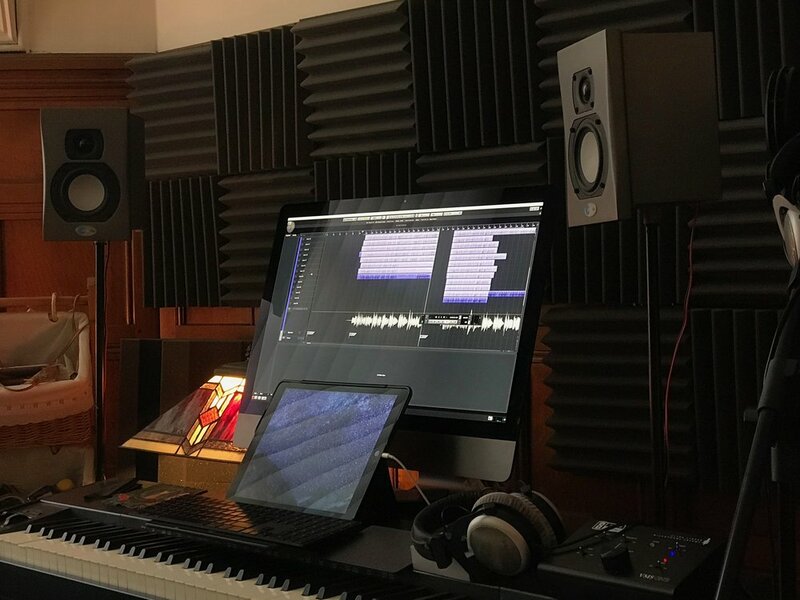 Using this method made me speed up my writing from spending a month per track to a week per track. Does that also include having it mixed and mastered? For me, I would always be mixing as I went along and for those companies that want me to do the final mix, it’s a case of making final tweaks. I don’t do mastering myself so that wouldn’t be factored into this. I saw you mentioned the book Think And Grow Rich by Napoleon Hill and how that had a positive impact on your career and business, how important has books in the self-improvement/business area been to you and your career? It had a big influence on me because it was at a point where I found it hard to get more work as a writer for other companies. However, at the same time, my own company started making a profit and I’ve had these business books on my iPad for years, but never looked at. Think and Grow Rich sounded like a 1950s stupid thing and I didn’t think I could be bothered, however, I had a read and I found it extremely inspiring. It was written in 1938 so some of the ideas are a bit dated, for example, it’s suggesting getting into radio because it’s booming. But if you ignore some of those dated elements it’s full of really good advice. The book also talks about how to build a team and how no one has ever been successful alone. Instead, reach out and find other people who are experts in an area you are not and share the profits. For me, that was a big revelation because I had always done everything myself. Many people who set out to, for example, make a living doing library music, making 52 tracks per year, etc., don’t do it consistently (year after year) as yourself and many other successful people have done, therefore not reaching their goals. Is being consistent something you worked on? Yes, you have to be consistent. Not only will it make you earn more money since the more music you consistently do the more royalties will come in, and for a longer period of time. Also, the more music you make the more people you are reaching out to and the bigger your network grows. You get to collaborate with more people and you will learn a lot more by staying consistent. Have you had any moments where you thought, "Damn, can't believe I’m doing this, I reached my goal"? I never had a moment where I thought I reached success and that ’s because I'm always thinking about what’s happening in the future. So, something can go really well but it’s more of a relief because there’s still another 1000 problems I need to care for. I have appreciated certain moments, for example, when I had a meeting at Walt Disney Studios and as I walked through the big doors into the studio I saw these big statues of the seven dwarfs and Walt Disney. That was a really nice moment. Looking at the other side of the coin, have you had any experiences where you wondered, "How can I get out of this mess"? Honestly, It’s not an exaggeration to say that I'm in a permanent state of having a mess to get out of. I'm expanding things really quickly, with new labels and new albums and that’s very expensive, tens of thousands of pounds is going out every month. I need to be able to cover all those costs, including salaries, fees, etc. There's always a sense of what could happen in three months or if we have a few bad months, could we cover our costs? I feel like I'm only ever a month away from disaster. Also, there are always things going wrong, for example, wrong names being put on projects and I got a legal letter from a composer from a few years ago saying that I hadn’t successfully promoted his material. He only had a tiny amount of tracks and earned a bit of money, but I still got a legal letter stating that I hadn't fulfilled my part of the contract by exploiting his music. I had to send a full list of all the websites where his music was available, saying sometimes people don't use it and, unfortunately, his music didn’t succeed. Sometimes people accuse us of copyright infringement, artwork infringement, there’s always something stupid coming in. Now, let me know what you think in the comments below, are there anything you will apply to your own career or anything you would do differently?